After all of the holiday celebrating and indulging, I was kind of in the mood for something a little lighter and a little more healthy. So I threw some spinach into a pan with some sun dried tomatoes, piled it high on top of a few tilapia fillets, and that was it! It couldn't have been simpler! It's pretty amazing how you can put together just a few simple ingredients and come up with a delicious, healthy, and elegant dinner! And it was SUPER easy! Seriously, anyone can do this one. Spray a casserole dish with nonstick spray. Place fillets in the dish. Season with salt and pepper. Set aside. Place diced onions in a saute pan with a a little oil from the jar of tomatoes. Saute for a minute or two. Add spinach. Cover the pan so that the spinach will wilt. After a few minutes, add tomatoes, garlic, and more salt and pepper. Toss until well combined. Pile the spinach mixture on top of each fillet. 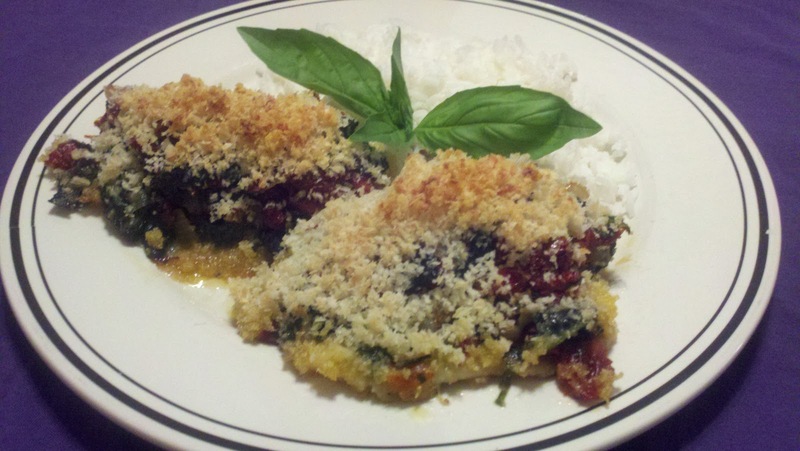 In a small bowl, mix together about a half cup EACH of the bread crumbs and the Parmesan cheese. Sprinkle over each heap of spinach mixture. Place in oven and bake until the fillets are cooked through, and the bread/cheese mixture is lightly golden. Since the flavors are so bold, serve it with something that serves as a blank canvas, such as plain white rice. The amounts are just guidelines. If you like a lot of something, add a lot! If you're not a fan of tilapia or fish fillets in general, try this same topping over some thinly sliced boneless chicken breasts.